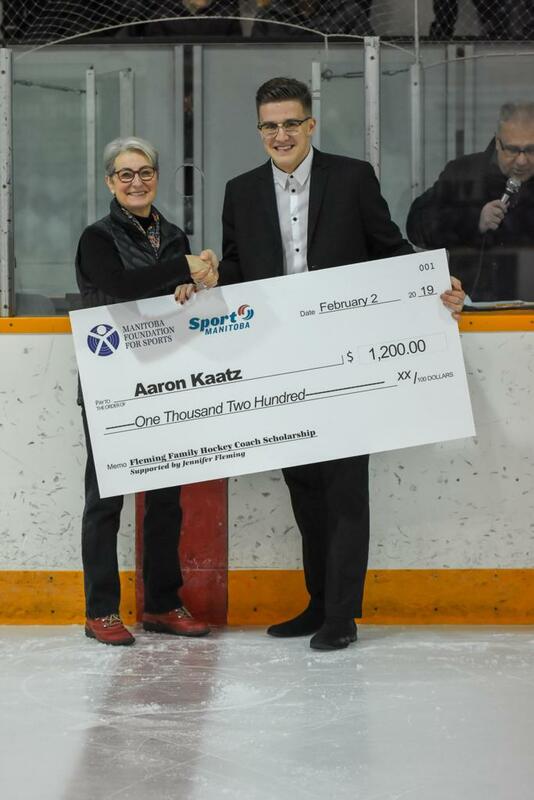 On February 2nd, the Bantam 1 head coach Aaron Kaatz was honoured with the Fleming Family Hockey Coach Scholarship. 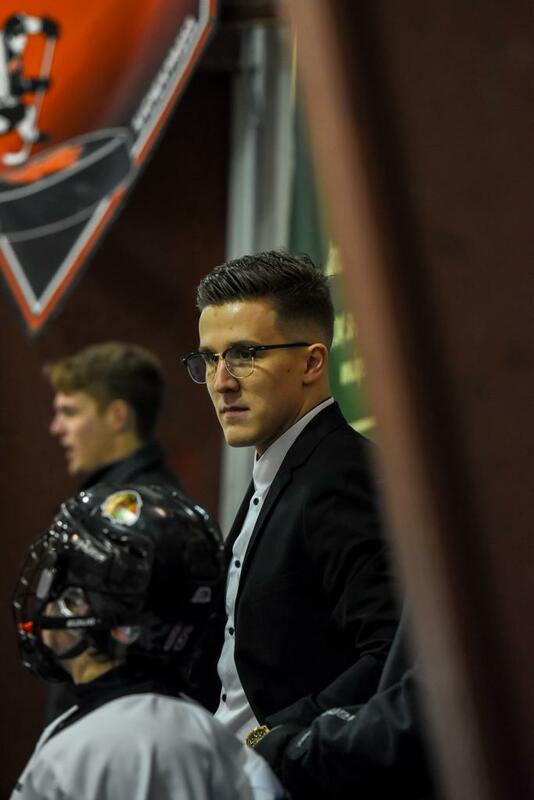 At only 23 years old Aaron Kaatz has been coaching hockey for the past 6 years of his life. When he was forced to leave playing hockey due to a knee injury, he quickly turned to coaching and giving back to the game he loved. 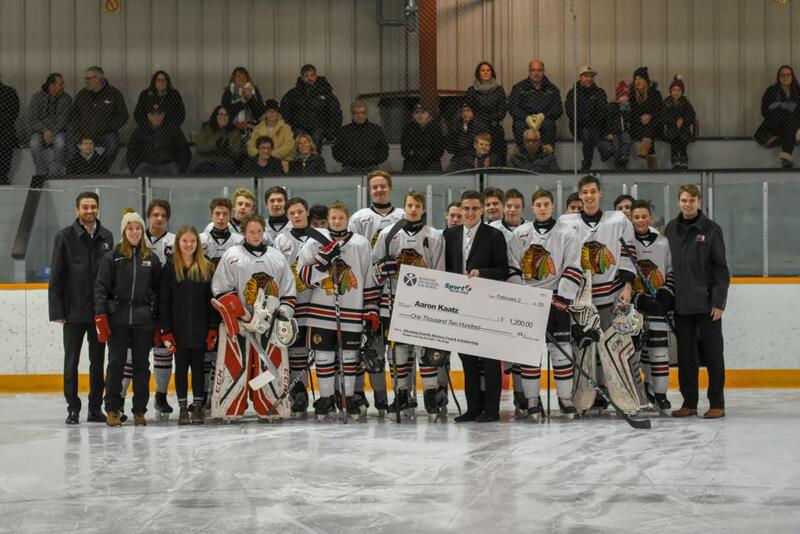 Aaron is in his second year of AAA coaching and is with the Bantam 1 Hawks team this year. Just this year he obtained his High Performance 1 coaching certification where he is also a trained hockey instructor. 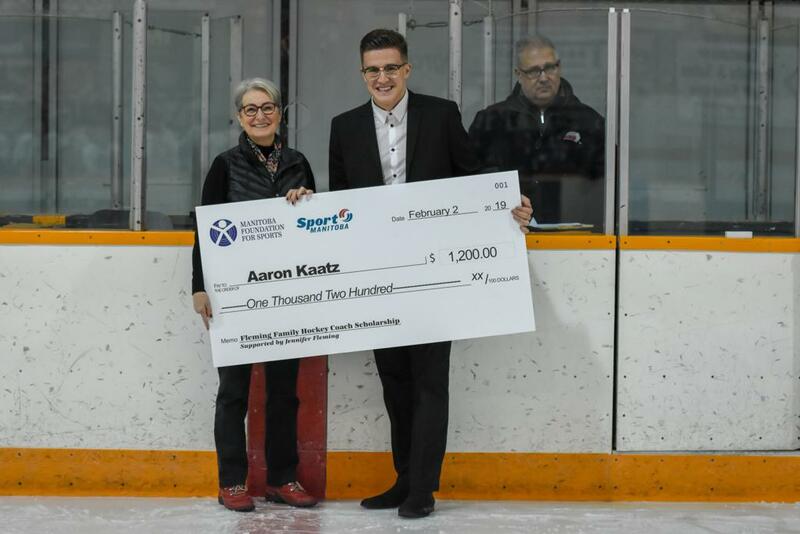 Recently completing his Bachelor of Business Administration at the University of Winnipeg and maintaining a very high GPA made him a perfect candidate for the Fleming Family Hockey Coach Scholarship. This scholarship was created by Jennifer Fleming, in memory of her father Jake Fleming and her brother Wayne Fleming. 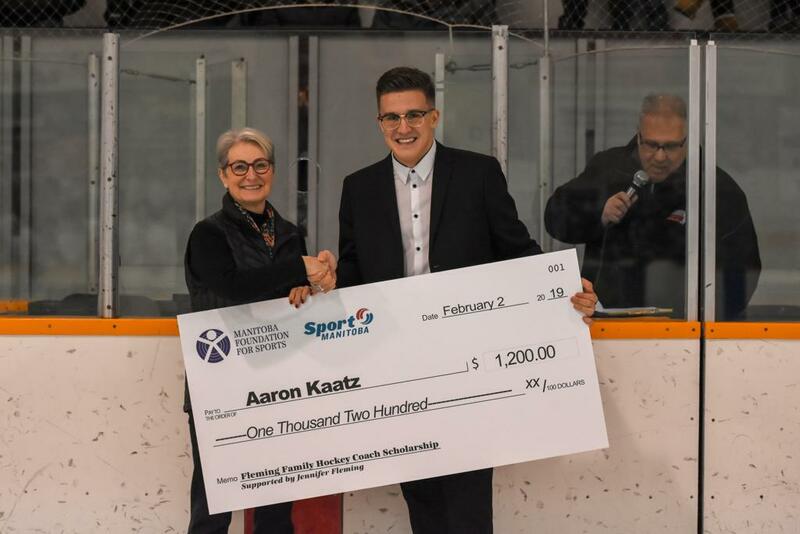 The scholarship recognizes an upcoming Manitoba hockey coach who demonstrates similar coaching and leadership traits that were characteristic of both Jake and Wayne. The Fleming family hockey obsession solidified in the early 1960’s which lead Jake to establish and operate the Canadian Professional Hockey Schools until 1991. Jake’s leadership was also instrumental in getting the AAA tier system started in Winnipeg, which makes tonight’s presentation to a AAA coach very special. In the meantime, Wayne’s love of coaching began with the CPHS. He went on to play four years for the Manitoba Bisons in the 1970s and was the team’s head coach for nine seasons in the 1980s. Wayne coached Team Canada in multiple Olympics, including the 2002 Gold Team, as well as numerous NHL teams. 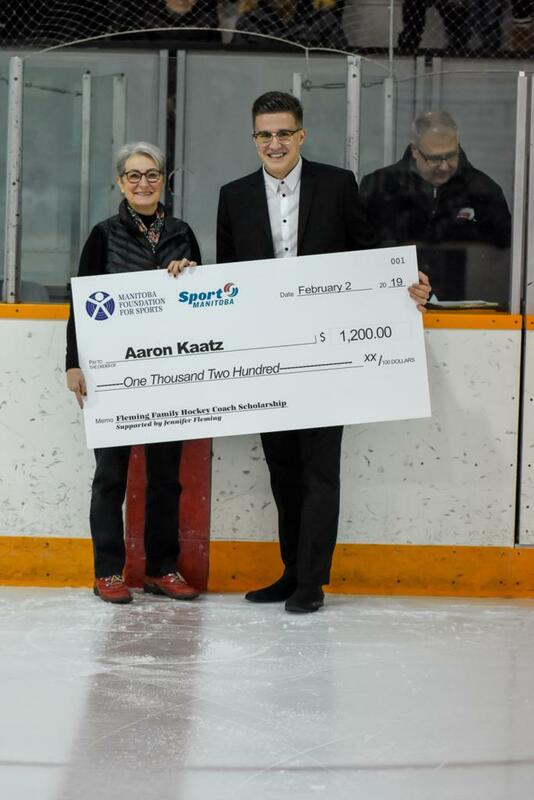 Congratulations Aaron and thank you on behalf of AAA Hockey Winnipeg for all of you hard work in coaching hockey’s future stars!